During his official visit to Argentina in November, Prime Minister Justin Trudeau welcomed the Argentinean Chamber of Mining Entrepreneurs’ (CAEM) adoption of MAC’s Towards Sustainable Mining (TSM) initiative and recognized the program’s strength in improving the mining industry’s social and environmental practices. The agreement made between MAC and CAEM in October represents the second time that TSM has been adopted by a mining association outside of Canada, and the first Latin American jurisdiction to do so. FinnMin, the Finnish Mining Association, adopted TSM in November 2015. MAC freely shares TSM with other countries seeking tools to improve the environmental and social performance of their mining industries, including engagement with civil society and Indigenous groups and enhanced transparency and accountability. MAC and its members launched TSM in 2004. Implementation of the program is mandatory for all MAC members’ Canadian operations, but many voluntarily apply it to their international sites. TSM requires mining companies to annually assess their facilities’ performance across six important areas, including tailings management, Aboriginal and community outreach, safety and health, biodiversity conservation, crisis management, and energy use and greenhouse gas emissions management. The results are freely available to the public and are externally-verified every three years to ensure what has been reported is accurate. While CAEM will tailor its performance areas so that they reflect the unique aspects of its domestic mining sector, they will closely resemble those of Canada’s. To ensure TSM reflects the expectations of civil society and industry stakeholders, it was designed and continues to be shaped by an independent, multi-interest advisory panel. As part of its implementation, CAEM will implement a similar advisory body to provide this valuable oversight function. The Canadian mining industry is focused on transforming how it operates through innovation. From adopting lower emission and renewable energy technologies to developing the world’s first diesel-free mine, innovation is one important way that the industry is helping to address climate change. MAC welcomes the Government of Canada’s commitment to invest $1.2 billion to support innovation in mining and other resource sectors. The Canada Mining Innovation Council (CMIC), with the active support of MAC and its members, has developed the Towards Zero Waste Mining (TZWM) innovation strategy to fundamentally transform the industry through innovation. The TZWM strategy is directly aligned with the government’s innovation, climate change and clean tech priorities. As such, CMIC is currently seeking a $50 million investment from the federal government over five years. Each government dollar will be matched by a mix of in-kind and cash contributions from industry. CMIC’s TZWM strategy will stimulate mining technology innovation in Canada to achieve zero waste in mining and mineral processing within 10 to 20 years. This will lead to significant reductions in greenhouse gas emissions, water use and tailings discharge, and significant improvements in energy efficiency, environmental protection and operational productivity. To support the transition to a low-carbon economy, Teck is focused on reducing its operations’ carbon footprint and advocating for global climate action. As part of these efforts, Teck has invested in low-carbon technologies, including alternative energy generation. In 2011, Teck set a goal of implementing 100 megawatts (MW) of alternative energy generation by 2030. As of the end of 2015, Teck had implemented 30.7 MW of alternative energy as it advances towards its long-term goal. 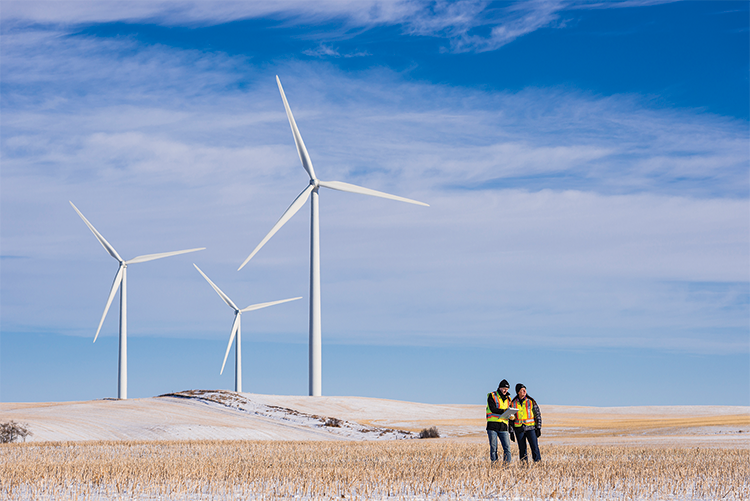 As part of their investment in clean energy, Teck worked with their partners to develop a large-scale wind power facility in Alberta called Wintering Hills and a community solar power facility in B.C. called SunMine. Wintering Hills is an 88 MW wind power facility consisting of 1.6 MW turbines that deliver power to the electrical grid. Teck’s Wintering Hills enabled the company to develop their understanding of power generation. This will help Teck to identify and evaluate other opportunities to develop power around their operations. The SunMine was built on Teck’s fully reclaimed Sullivan Mine site and supported through a $2 million contribution. SunMine, which is owned and operated by the City of Kimberley, has 4,032 solar-cell modules, mounted on 96 solar trackers that follow the sun’s movement to maximize solar exposure. It is Western Canada’s largest solar power facility, and the first developed, owned and built by a municipality in Canada. It is also the first built on a reclaimed mine site. Teck’s wind power facility, Wintering Hills, Alberta. Goldcorp’s Borden Gold Project near Chapleau, Ontario is poised to become the first all-electric underground mine in Canada. It will be the first to employ an entire fleet of battery and electric mobile equipment. Not only will the new equipment reduce energy costs, but it will also generate significant environmental benefits. In fact, fuel switching from diesel to electric represents the largest opportunity to reduce emissions. Battery and electric mobile equipment generates 20% to 40% less greenhouse gases and heat loss than traditional diesel-powered equipment. Goldcorp is also introducing other innovative clean energy technologies at the Borden project, including a state-of-the-art “on demand” ventilation system, tele-remote equipment to allow for more continuous mining, renewable energy and storage, and digital mining and smart control technologies. Together, Goldcorp estimates that these innovative and clean technologies will eliminate 75% of GHG emissions at the future mine. We thank everyone who participated in MAC’s Mining Day on the Hill advocacy event on November 22nd. Teams of MAC delegates participated in some 50 meetings with Parliamentarians and their staff, as well as senior government officials from a wide range of federal government departments that focus on mining. This year’s theme was Canadian Mining: The Foundation of Canada’s Sustainable Future. MAC delegates discussed how the Canadian mining industry can play a powerful role in Canada’s transition to a low-carbon future, in growing the economy, and in closing the socio-economic gap between Indigenous and non-Indigenous Canadians. On climate change, MAC emphasized that an effective price on carbon must take into account trade-exposed sectors like mining and vulnerable regions like the North. The meetings also focused on the significant opportunities to increase sustainable mining development and the many contributions that flow to Canadians as a result. However, the regulatory, tax and mineral decisions made in the short term will directly influence Canada’s ability to seize them and compete against other mining countries for new mineral investment. 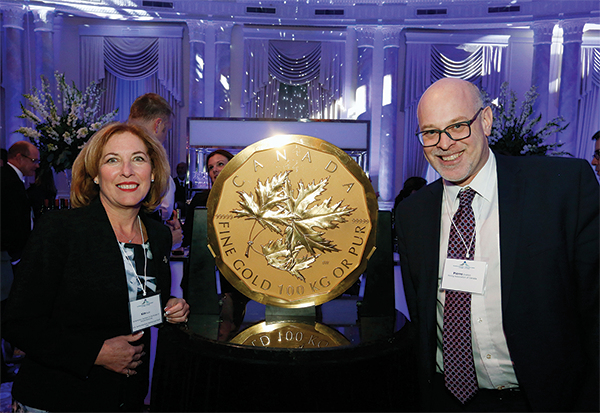 The event concluded with MAC’s Annual Reception, which showcased several exhibits from the Royal Canadian Mint. Kim Rudd, Parliamentary Secretary to the Minister of Natural Resources and MP for Northumberland—Peterborough South, delivered remarks recognizing MAC members’ commitments to sustainable mining and the unique role that the industry can play in achieving the government’s goals with respect to climate change and innovation, Indigenous reconciliation, and the economy. Pierre Gratton, MAC’s President and CEO, and Kim Rudd, Parliamentary Secretary to the Minister of Natural Resources, at MAC’s Annual Reception. The Community of Interest Panel (COI Panel), an independent, multi-interest group that advises MAC, released a statement on actions the association and its members can take to continue addressing climate change. The advisory statement, Rising to the Challenge, is intended to enhance and expand on MAC and its members’ commitment to be constructive partners in the global fight against climate change as part of its recently released Principles for Climate Change Policy Design, which included support for a broad-based price on carbon. The COI Panel is an independent, multi-interest group comprising individuals from Indigenous groups, communities where the mining industry is active, environmental and social NGOs, and labour and financial organizations. A key role of the Panel is to provide advice on current and emerging priority issues and to encourage MAC member companies to improve social, environmental and economic performance. The Mining Association of Canada (MAC) is the national organization for the Canadian mining industry. Its members account for most of Canada’s production of base and precious metals, uranium, diamonds, metallurgical coal, and mined oil sands, and are actively engaged in mineral exploration, mining, smelting, refining and semi-fabrication. Copyright © 2016 Mining Association of Canada, All rights reserved.